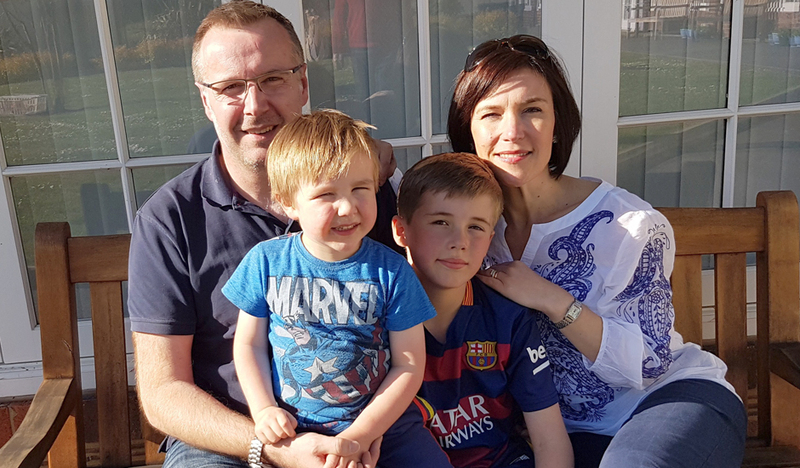 To mark World Mental Health Day on 10 October, Gateshead family, the Halliwell’s, say the ‘huge impact’ on their mental health would have been worse without support from Rainbow Trust Children’s Charity, after their son was diagnosed with a life threatening illness. Mum Natalie Halliwell shares their story to help raise awareness of mental health and Rainbow Trust. In early 2013 her son Dominic was just 10 weeks old when he was diagnosed with a cancerous mass on his brain, spinal column and central nervous system. For the next five months, Natalie stayed by his hospital bedside leaving her five-year- old son Zach at home with her husband. “The few weeks that followed were extremely difficult and I had to juggle a whole range of emotions on very little sleep and with a small support network,” Natalie said. “I stayed with Dominic in the hospital but I felt very alone during those first few weeks, and my role as primary carer for my baby was removed from me as his little body required regular medication and checks from the medical team, rather than me. The family was referred to one of our Family Support Workers, who support families at home, in hospital and in the community, wherever they are needed. Natalie said Durham based Family Support Worker Vicky turned their lives around. “Being referred to Vicky was a life saver for our family,” she said. Once Dominic was finally discharged from hospital, Natalie and her husband Chris faced fresh concerns. “Although we were happy to be home with Dominic, we had to balance this with the stress of not being near medical help,” Natalie said. The support we provide enables families who have a child with a life threatening illness to make the most of their time together. “What Vicky and Rainbow Trust understand is the importance of keeping a family functioning. The sick child is cared for by the medical professionals but if the family do not receive external support the impact on their mental health is huge. What should the NHS be doing over the next 10 years?